When you think of Easter and vegetables, many think of carrots because that’s what the Easter Bunny eats, right? 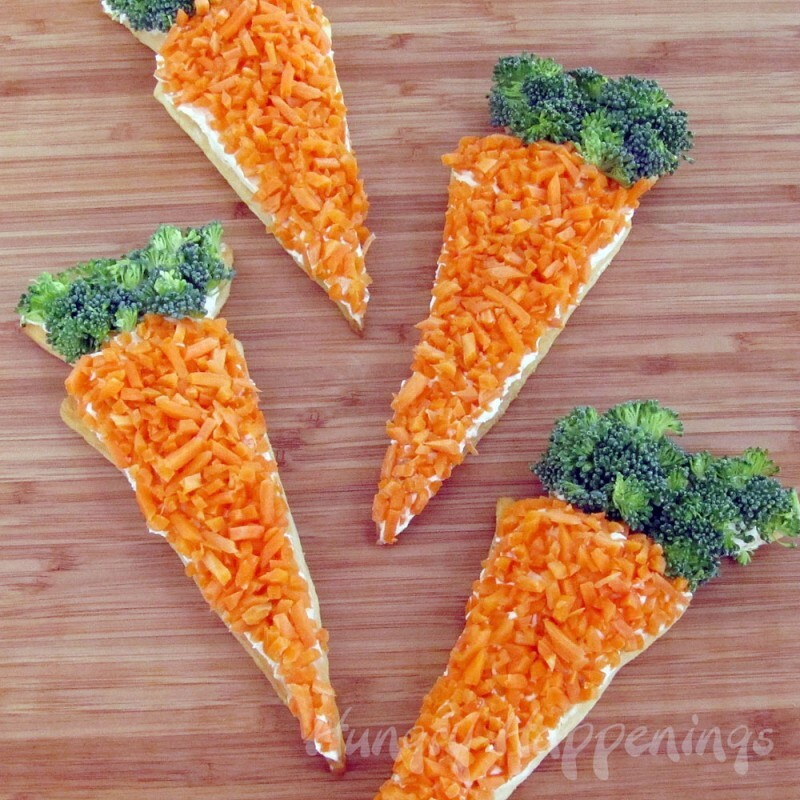 So what better recipe than to make carrot-shaped veggie pizzas. They’re quick and easy to make, not to mention they make a great addition to any Easter meal. Plus, with the fun theme and exciting presentation, it’s sure to entice your kids to eat their vegetables. Dust a cutting board with flour. Unroll the crescent rolls and separate them at the perforations. Use a pizza wheel or knife to cut the crescent rolls into carrot shapes. Take the excess dough and cut it into 3 pieces. Brush the top edge of the crescent roll carrot with cream, milk or egg white. Press one end of each of the three excess dough pieces onto the top edge of the crescent roll carrot creating the green leafy part of the carrot. So that the carrots don’t stick to the parchment paper, sprinkle a light dusting of flour over the area that was brushed with the cream, milk or egg white. Turn the carrots over and place on your lined baking sheet. Refrigerate for 15-20 minutes. Meanwhile pre-heat oven to 400 degrees. Bake crescent roll carrots for 7-10 minutes until golden brown. Allow to cool completely. Equally divide the veggie cream cheese and spread it on top of each carrot. Sprinkle finely chopped carrots over the triangle part of the carrot and then add broccoli to the top. Your carrots are ready to serve. You can cover and keep in the refrigerator for up to two days. If you want some variety, use orange bell peppers in place of the carrots, and any green leafy vegetable in place of the broccoli.